Each villa is equipped with a kitchen (ceramic hob, oven, fridge, microwave, cutlery, kitchen utensils, crockery and glasses); a living room, television with a wide selection of satellite channels, outside line telephone (with charge); air-conditioning in all the rooms, independently controlled; en-suite bathroom with bath and/or hydro-massage shower; furnished terrace. A certain number of villas are adapted for disabled guests. • Free WiFi in all villas and open areas of the hotel. • Reservations at the nearby high achieving Sports Centre "Tenerife Top Training"
Restaurant La Torre, located on the first floor overlooking the Plaza, offers a sumptuous buffet breakfast, and by night, elegant and intimate dining, serving excellent local typical Canarian cuisine as well as the Chef's modern and creative gastronomy. For a lighter meal, the Pool Bar offers a variety of lunch dishes. Suite Villa Maria has an entertainments area suitable for weddings and business meetings, and a large conference room which can be divided into three smaller rooms (175 sqm). 25 minutes from Tenerife South airport and one hour from Tenerife North airport. Golf Tenerife - Gran Canaria offers reduced green fees on Buenavista Golf Club, Costa Adeje Golf Club, Amarilla Golf , Golf del Sur, Real Club de Golf de Tenerife and Las Americas Golf for all clients. The Hotel Suite Villa Maria is comprised of a complex of 78 exclusive villas inspired by the distinctive Canarian architectural style. Perfectly integrated with the surrounding Costa Adeje golf course, it enjoys an enviable position with magnificent views of Costa Adeje, La Gomera and spectacular sunsets. 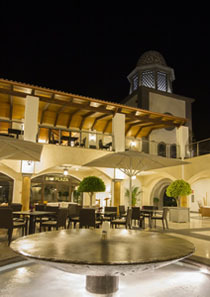 This unique hotel, situated in the South of Tenerife, is just 25 minutes from Tenerife South airport and one hour from Tenerife North airport. The principal hotel services are found in the main building, dominated by a central Plaza: the Reception, Plaza Bar and Restaurant ‘La Torre’. There are two swimming pools on different levels (both heated), which are located in the central part of the hotel complex. Poolside there is a children's pool, extensive sunbathing terraces and Pool Bar. 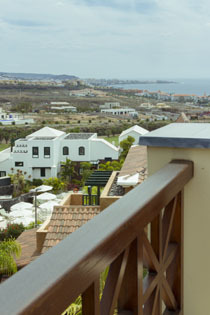 The villas and walk-ways throughout the resort are all surrounded by beautiful landscaped gardens.